Toth, watching the ceiling fan and (I think) trying to grab it with his hands. This was taken just now, and it's the most animated we've ever seen him. 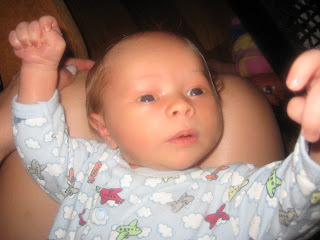 He's starting to look more like a regular baby and less like a newborn already, eh? And I just noticed that the sleeper he's wearing tonight, size newborn, is a little tight. Fit him fine last week. Also, his cord stump fell off today. So I celebrated by giving him his first real bath (and the first bath from me -- Epu gave him his sponge baths before this), and he celebrated by pooping in the towel. My first week at home is going fairly well. It really hasn't been that hard to manage the 3 kids together, mainly since Toth still sleeps almost all the time. Dinner hasn't hit the table before 7:30 p.m. once and the house is a cesspool, but everyone's gotten fed three meals a day and having their teeth brushed at least once and having their diapers changed in a relatively timely manner so I guess I'm doing fine. Today I even took all the kids bargain shopping, and now we have a negative balance in our grocery spending so far for the week. On the downside, sleep is scarce and that's being compounded by the fact that Pebbles has decided this week that she does not take naps anymore. Perfect timing, right? She also started climbing out of her crib, so just leaving her in there until she finally falls asleep is no longer an option. So those afternoon naps that I thought would help make up for the sleep I'm losing at night are not happening. The lack of sleep makes me anxious and irritable, of course. I typically start out the day with tons of patience with the girls, and it just dissipates as the day goes on. By dinner I'm yelling at a 2-year-old for putting her hand in her bowl, which, let's face it, is pretty normal 2-year-old behavior. You can imagine how I reacted tonight when Nutmeg decided to coat part of the dining room table with sprayable sunscreen, which ended up taking off the finish due to the high alcohol content. Not gracefully. Having a messy house also makes me feel anxious. But tomorrow morning I get to take the kids to the local drop-in parent support center where I'll get two and a half hours to work, interrupted only by Toth, and as much as I like to get my blogging done, I can't mind an interruption from a gentleman THAT cute. I mean, scroll back up a second. See what I mean? omg. the sprayable sunscreen incident would had me in tears, for sure. ugh. i know what you mean about having a messy house and feeling anxious. i feel the same way, but i am trying to tell myself that this state of affairs is only temporary. Ah -- worshipping the fan god. I only have one and I can't seem to keep it together, so don't feel bad. You sound like you're doing a stellar job - especially on no sleep. You'll have a new routine down pat in no time :D Enjoy your break today! yah after having ARB, for weeks, we kept seeing our house getting messier and messsier and dirtier and dirtier while ARB wouldnt sleep, and I was getting so anxious b/c I/we just had no energy to clean, so we were luckily had money to hire a cleaner who comes over every 2 weeks. That has been a major, majjor, stess reliever. If we did't hire one, social services would have taken our kids away b/c our house would have been unlivable by now b/c we would never cleaned. lwwb -- We even already have the every-other-week cleaner, which totally makes sense for us because I tend to be working from home a lot instead of cleaning. But the cleaner doesn't help with the clutter. The clutter I think makes me more nuts than the actual dirt. The funny thing is that people will tell you cut yourself some slack, just ignore the housework because no one expects you to keep a spotless house at a time like this. But that's not the point, is it? The person in the house the most is ME, and I'm the one who hates this kind of environment. Sigh. I'll catch up eventually. Wow, you have a drop-in parent support center? How cool is that! How'z it work? Oooh. I didn't even think about sunscreen on a finished surface! Yikes. Hope you are having a better week!